Meath made it three wins from as many starts in the Allianz HL Division 2B with eight points to spare over visitors Mayo at Trim on Sunday. Cillian Farrell's charges capitalised on their strong wind advantage in the opening half to construct a 16-point interval advantage. Eight points was as close Mayo got to Meath thereafter but they never looked like bridging the gap. Nine different players contributed to Meath's tally as they recorded their third league win on the spin. 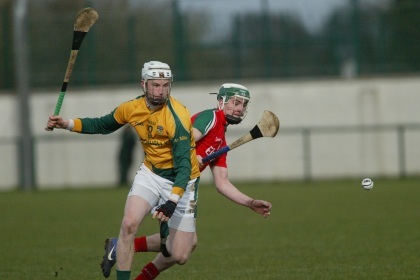 Stephen Clynch took scoring honours for Meath with nine points (three from play. Goalscorer Adam Gannon was the home side's top marksman from play with 1-1. Shortly after the restart Barry Slevin had the sliotar in the Mayo net, but it was ruled out for 'square' ball. Later the Na Fianna clubman placed Gannon who blazed low and wide from close quarters. Four different players registered for Mayo including goalkeeper Donal O'Brien. The Ballyhaunis clubman netted from a 20-metre free midway through the second-half and left Mayo 1-5 to 1-16 off the pace. Mayo who had drawn at home with Roscommon in their only previous league outing were heavily dependent on midfielder Kenny Feeney for scores from play and placed balls. Meath centre-half-back (and later midfielder) James Toher capped another impressive showing with the home side's final score, from a 64th minute free. Two late Feeney scores (frees) softened the look of the scoreline from Mayo's perspective. With wins over Down (away) and London (home) behind them and a strong wind in their sails, Meath took matters to Mayo from the off. Within a minute of the throw-in Clynch landed a free from midfield. It was the first of eight opening period points for the Kilmessan man who accounted for almost half of Meath's first-half tally. Adam Gannon, Barry Slevin, Peter Durnin and hard-grafting Paddy Conneely also registered for Meath in the first 35 minutes. Mayo were unfortunate not to goal in the 7th minute when Nathan O'Malley's first time efforts struck Shane McGann's right-hand post and rebounded into the play. Had it gone in, the scores would have been tied. By the mid-point of the half, Meath had registered seven points. In a difficult wind the Royals' wide count reached nine by half-time. Clynch's 22nd minute pointed free from from half-way and a Barry Slevin score from the left seconds later were the pick of the flags raised in the opening half. The opening goal arrived in the 24th minute when Gannon steered a long delivery to the Mayo net. Wexford referee Justin Heffernan consulted with his umpires before confirming the Killyon man's score. Mayo got off the mark in the 30th minute with a Sean Regan free. Two Clynch points (one free) closed the first-half scoring. Meath looked set for their third win from as many league outings when leading by 1-14 to 0-1 at the break despite having to face the elements from the resumption. Scorers: Meath - Stephen Clynch 0-9 (6s), Adam Gannon 1-1; Barry Slevin 0-3; Patrick Conneely 0-2; Peter Durnin, Stephen Morris, James Toher (f), Eoin Marsh 0-1 each. Meath - Shane McGann; Willie Mahady, Damien Healy, Cormac Reilly; Stephen Morris, James Toher, Shane Brennan; Sean Heavey, Stephen Donoghue; Eoin Marsh, Peter Durnin, Paddy Conneely; Adam Gannon,Stephen Clynch, Barry Slevin. Subs - James Kelly for Conneely (45), Aaron Ennis (52), Jonathan Meyler for Donoghue (62), Neil McLoughlin for Brennan (68), David Foley for Reilly (70). Mayo - Donal O'Brien; Adrian Brennan, Aiden Connolly, Brian Hunt; Ciaran Finn, Ciaran Charlton, Padraig O'Flynn; Gary Nolan, Kenny Feeney; Nathan O'Malley, Adrian Guiry, Sean Markham; Stephen Hoban, Derek McDonnell, Sean Regan. Subs - Darren McTigue for Guiry (41), Andrew Butler for Markham (58), Fergal Lyons for O'Malley (65), Declan Gallagher for Finn (69).